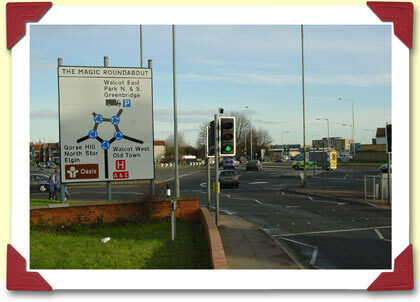 The 'Magic Roundabout' is one of Swindon's finest traffic-flow alleviation schemes along with the Queen's Drive and the Stratton St Margaret by-Pass. The device consists of a central roundabout of conventional style with five satellitic contra-rotating roundabouts arranged around the periphery. Introduced in 1982 at the boundary of Fleming way, Drove road, County road and Queen's drive, the roundabout won the Traffic Flow silver star for 1983. It is lit by no fewer than ten sodium discharge lights and has an ingenious self-draining system. Picture taken: September 1999.